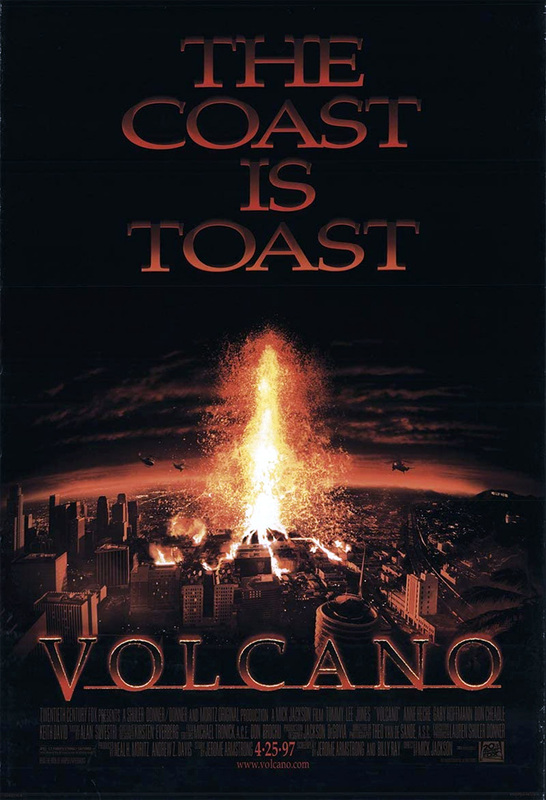 Lava threatens to destroy Los Angeles, Tommy Lee Jones and Anne Heche. VIOLENCE/GORE 6 - A man is slowly engulfed in flames as he screams and sinks into lava. Lots of people are hit with "lava bombs" and are immediately engulfed in flames as they flail and scream. A character is trapped in a truck as the lava engulfs it. A couple of scenes with people reaching out trying to escape the flames engulfing them. A couple of brief shots of burns on faces, heads and legs; the side of a man's face is severely burned and looks like pulp. A girl puts pressure on a bloody leg wound with squishy sounds. Lots of hospital patients, some with blood on their bodies/bandages. A girl has a bloody bandage on her leg and a bloody scrape on her cheek through most of the film. Lots of earthquakes. Car crashes. Explosions and fires caused by lava. LANGUAGE 6 - One F-word and one F-word nearly said, many mild obscenities, many scatological references, a couple of anatomical references. DISCUSSION TOPICS - Geological activity, volcanoes, the Office of Emergency Management, fatherhood. MESSAGE - Any geological disaster is possible, anywhere, at any time.